The big Beijing chill is well upon us; what better way is there to thaw those bones than with a steaming bowl of soup noodles? So stash away your dining decorum, roll up them sleeves and get slurping on one of these. You know you’re in good hands just from the name Chi Mian Guan. It plays on the word “chi” meaning “crazy/infatuated”, which happens to have the homophone “eat”. The Taiwanese owner/chef is a self-professed noodle-lover and dotty for the doughy stuff. He spent over a decade traversing across China and sampling his way through the noodle landscape, and now rounded up some of his favourites under this one roof. Whether it’s Shanghai rib soup, Sichuan dan dan, Shaanxi sizzling oil or Beijing zha jiang noodles, he says his secret to an authentic flavour, is using regionally-sourced ingredients. There’s no cutting corners - from soy sauce to bean paste, using the original seasoning is what creates that taste of home. Treat yourself to the signature Taiwan braised beef noodles for ¥38. It’s first come first serve, as there’s just a limited quantity each day. The stock is slow-cooked for 7 hours, the prime beef leg cuts added to stew half way through, and the twist is the Sichuan dou ban jiang, or fermented bean chilli sauce, that gives it the kick. You’re served up a tricolore of richly hued soup, freshly-pressed noodles, crisp green pak choi and sprinkling of spring onions, not to forget the generous chunks of tender beef. Every dish here has a story, so if you get the chance to steal the owner for a minute or two, do ask him to impart some of his near-encyclopaedic noodle knowledge. Tendons huh, who have thought it could taste so good. This noodle joint has the feel of exclusivity, with its discreet entrance, and very limited bar seating around the open kitchen. You’ll feel like you’ve stumbled across a secret. The noodles are kneaded and hand-pulled to your order – you pick the thickness. Hot soup is ladled up, the brisket, tendon and tripe loaded on, and you’re ready to go. Noodles can be ordered solo for ¥38, or as a set menu for ¥10 more that will give you a cold platter of side dishes such as preserved vegetables, bamboo shoots and the like, and bottomless oolong tea. There’s also a mixed wild mushrooms soup noodle for the vegetarians. 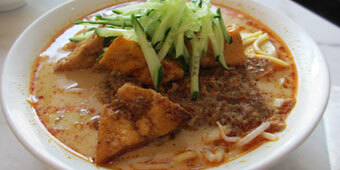 Guo qiao mi xian – literally “over the bridge rice noodles” – is the provincial specialty. The story goes: there was an ambitious soul in imperial China, who studied day and night on an island at a heart of a lake for the scholarly exams, the ticket to officialdom. His dutiful wife brought his meals, but by the time she crossed the long bridge and reached her man, the food was cold and soggy. One propitious day, she stewed an entire chicken, and set off with the pot of broth, coupled with drained rice noodles, vegetables and pickles. Lo and behold, the surface layer of oil acted like a thermos lid, keeping it hot. And thus your meal was born. At Cha Hua Mei Zi, a “Scholar” set for just ¥18 will get you a 14-plate ensemble with your soup and noodles, with the likes of chicken slices, bean sprouts, mu’er and quail eggs; or upgrade to the ¥ 38 “Top Scholar” set of 24 plates that includes additional seafood and a clay pot of chicken. Plus you can always add supplements for a yuan or two dent in your pocket. Do as the wife did and stir it all in to your steaming bowl (basin would be more accurate). Extra marks to Cha Hua for the minimal seasoning that preserves the natural flavours of the ingredients. While it’s a departure from noodles, this Shaanxi dish is hugely worthy of a spot on this list. This is chunks of flat bread, or mo, in mutton soup. The meat is slow-cooked until it falls off the bone. The bread is unleavened and baked on an open pan, giving it its chewy and taut texture so it can soak up the soup without disintegrating – a perfect companion. The chefs at the Shaanxi Administrative Office restaurant know what they’re doing, and rest assured there won’t be any mutton flavourings or suspiciously milky broth as in some of Beijing’s Shaanxi eateries. The wafting aromas will have you salivating as soon as you walk in. In many pao mo restaurants in Shaanxi, you have the option of breaking the bread yourself, though no such fun, or what some would call an agonizing process, here. Don’t hesitate to opt for the ¥28 big size. Fresh coriander uplifts the intensity of the mutton. But if you’re not a fan, worry not as it is served separately, along with chilli sauce. Spoon up a bit of everything – mo, soup, meat, vermicelli, and then take a nibble of the sweet pickled garlic cloves that are an essential side – it’s comfort food that will warm you right to the core. Chinese gourmands will tell you that a clear broth is the nirvana of soup. And that’s what Dong Fang Gong is aiming for. The chain is under the flagship of Yan Lan Lou, the established restaurant offering Muslim northwestern cuisine. Choose from traditional beef soup or with preserved vegetables - ¥18 for a small and ¥21 for a large, though bear in mind the generous portions here. And then the fun begins. Head over to the noodle shi fu, and tell him which of the NINE, yes nine, styles you desire – from “thread thin” to “buckwheat edged”, “chive leafed” to “great wide”. A little excessive maybe, but it’s a reflection of the Chinese high regard for the art of noodle-making. Noodle chefs take pride in being able to produce perfect pulls in precisely numbered hands. The “thread thin” for example is achieved in eight pulls to yield 256 strands, and on the other end of the scale, the “great wide” in three pulls to stretch a total of 4 meters. For ¥10 extra, load up with a plate of sliced beef sold by the liang, or 50 grams, and dive in. Lao Pa Sak serves up curry laksa, which is a coconut-based curry soup, with dried bean curd, fish cakes, shredded chicken, a boiled egg and topped off with julienned cucumber. Choose between regular wheat noodles or the lighter rice variety. The seafood taste is fairly strong, combined with the curry and almost creamy consistency, this makes a heavy but immensely satisfying offering for ¥45. Try also to the fried turnip cakes – brown sauce essential- and milky tea. With its prolific openings across the capital, you’ll never find yourself too far away from a reliable bowl of Invincible’s ramen. Their signature is the pork bone ramen, or tonkotsu, made by stewing pork and chicken bones for hours on end, giving it its appealing milky sheen and density. Take your pick from “platinum” and “gold” for ¥38 – the former being the un-tampered with stock simply seasoned with salt, and the latter flavoured with soy sauce. Then choose how soft or al dente you want your noodles. Half a soft-centred egg, slices of tender char-sui pork, greens, and seaweed deck out the dish. Order a super-food side of spinach in that addictive sesame dressing, and you’ll have a meal to please both your stomach and mind. Tried Chi Mian Guan 痴面馆 twice now and can definitely recommend it. High quality, great taste - tried the zha jiang mian and Taiwanese beef noodles. Will keep going back. The only issue is they often run out of everything early as it's so popular, so try to get there before the lunch rush.